A historical essay on the transition from Russian Revolution of the Soviets to bureaucratic dictatorship under Stalin, with special emphasis on the period extending from the February Revolution to the period of War Communism. The Russian Revolution is the most important historical event of the 20th century, and for some historians it is even accounted as one of the great events of human history. Its influence on international relations, political ideologies and word history from 1917 to 1991 is indisputable. Trotsky, in the preface of his History of the Russian Revolution, claimed that “[t]he most indubitable feature of a revolution is the direct interference of the masses in historical events” and the acceleration, over brief periods of time, of the pace of economic, social and political change, in addition to the emergence of radically opposed political poles, and the shift of the social support of the masses towards parties of an increasingly extremist type. The Russian Revolution must not be understood as a mere coup d’état, reduced to the storming of the Winter Palace, but as a historical process that began with Bloody Sunday and the revolutionary events of 1905, and underwent an uninterrupted period of development until the mid-1920s. The Russian Social Democracy, split since 1903 between Bolsheviks and Mensheviks over organizational issues, displayed three distinct analyses of the nature of the revolutionary process that began in 1905: Plekhanov’s analysis (Menshevik), Lenin’s (Bolshevik) and Trotsky’s. For Plekhanov, the revolution could only be bourgeois. The state would cease to be led by the feudal nobility and would pass into the hands of the bourgeoisie. Once the bourgeoisie was securely in power, the workers will follow the democratic and parliamentarian road, in order to gradually obtain a larger and larger share of power, until they finally establish socialism in a uncertain and distant future. Lenin admitted the bourgeois character of the revolution, but denied that it would have to be led by the bourgeoisie, which in Russia was too weak to confront the nobility. He proposed the workers and peasants alliance as the only means that could possibly create a revolutionary power, one that would carry out a profound agrarian reform without, however, abolishing the capitalist structures. With the development and consolidation of capitalism in backward Russia, the proletariat would increase in numbers and would become so strong that the time would come when it would take power and begin to build socialism. Trotsky’s position, which is distinct from both the Bolshevik and Menshevik positions, asserted that the workers were already capable of taking power, and diverged from Lenin’s position in that he thought that the absence of the objective conditions for first stages of the construction of socialism would be compensated for by the permanent character of the revolution, which would make it possible to skip the intermediate stages, which the Marxist theoreticians considered to be necessary, in order to pass directly from the bourgeois revolution to the socialist revolution. Lenin advocated Trotsky’s position in the so-called April Theses (1917), in opposition to the immense majority of the Bolsheviks, who argued for the exclusively bourgeois character of the February Revolution. The Russo-Japanese War was a military and economic disaster of enormous proportions, and unleashed a wave of popular protest that became the first stage of the Russian revolutionary process. On January 3, 1905, the strike at the Putilov works in Saint Petersburg began. On Sunday, January 9 (“Bloody Sunday”), Czarist troops fired into a peaceful and defenseless crowd, led by Father Gapon, that was attempting to deliver a petition to the Czar, leaving hundreds dead and thousands wounded. The strike spread throughout the entire country over a period of two months. In June, the sailors of the battleship Potemkin mutinied in Odessa; in October the naval crews at Kronstadt revolted; and in November the uprising on eleven ships at the naval base of Sebastopol. In Saint Petersburg the first Soviets emerged, for a very brief period. The Czarist government responded with brutal repression and, when it was confronted by the threat of a general strike, the promise made by Nicholas II to convoke the Duma. In June 1906 the first Duma (Russian parliament) met, with a Kadet majority (KD, the Constitutional Democratic Party), with the intention of establishing an authentic parliamentary regime, which they sought to bring about by means of an indispensable agrarian reform, which would lead to the emergence of a peasant middle class (the kulaks). The new prime minister Pyotr Stolypin spearheaded a whole battery of reforms whose purpose was to create greater concentration in landownership at the peasant level, favoring the rise and expansion of an agricultural proletariat, which would in turn increase the influence of the socialist parties in the second Duma (February to June, 1907). The revolutionary movement, which had begun in 1905, shifted from the cities to the peasant villages, a shift characterized by constant social agitation, which led the regime to implement regressive reforms of the electoral system, so that the third Duma (1907-1912), of an autocratic composition and disposition, was known as the Duma of “nobles, priests and lackeys”. During this period the Czar’s Court was suffering from the presence of the so-called “messenger of God”, the Siberian peasant Rasputin, who exercised a disastrous influence on the Czarina and discredited Czarism, even among its most loyal supporters. Stolypin was assassinated in 1911, and he was succeeded by a series of ineffective Prime Ministers, who faced a docile assembly in the fourth Duma, hardly inclined to support reforms and incapable of making any concessions to the agitations among the workers in 1912. The Balkan Wars seemed to offer an opportunity to distract the attention of the masses, but the results could not have been worse, as the Russians lost all their influence in the region. Czarist reformism, utterly spineless, had met with an overwhelming failure. Russia was not prepared for the war of attrition it faced after the first few months of the war (1914). The Czarist army lacked modern weapons, adequate means of transport, efficient commanding officers, appropriate tactics, a logistical network, etc. ; it could only count on an immense mass of soldiers, who were treated as cheap cannon fodder by an incompetent officer corps staffed by the corrupt nobility. “The one thing the Russian generals did with a flourish was to drag human meat out of the country. Beef and pork are handled with incomparably more economy. Grey staff non-entities … would stop up all cracks with new mobilisations, and comfort themselves and the Allies with columns of figures when columns of fighters were wanted. About fifteen million men were mobilised, and they brimmed the depots, barracks, points of transit, crowded, stamped, stepped on each other’s feet, getting harsh and cursing. If these human masses were an imaginary magnitude for the front, for the rear they were a very real factor of destruction. About five and a half million were counted as killed, wounded and captured. The number of deserters kept growing” (Leon Trotsky, The History of the Russian Revolution, Volume One, Sphere Books Ltd, London, 1967, pp. 35-36). After the initial success of the Russian offensive in Galicia (1914) that forced the Austrians to retreat to the Carpathians, the technical deficiencies of the Russian army, the mediocrity of its officers, the discontent and mistrust of the peasant-soldiers and bureaucratic chaos provoked the collapse of the front, which allowed the Germans to occupy the provinces of Poland and Lithuania (1915). The Brusilov offensive in Bukovina and Galicia came to an end amidst terrible losses in dead and wounded, and led to the appearance of the first symptoms of generalized discontent in the Czarist army (1916). The Russian soldiers lacked not only weapons, but boots as well, which were indispensable in the harsh Russian climate. Supplies became scarce and some troops were starving. In this context, military discipline had to collapse. There were thousands of deserters. Divisions only existed on paper; in reality there was nothing but an amorphous, disorganized, underfed and poorly equipped, sick, undisciplined and badly led crowd. The despotism of the officer corps made life for the troops intolerable as a result of its cruelty and corruption. Some officers even sold the wood and barbed wire necessary for constructing trenches. In October 1916, the war’s cost for Russia was one million eight hundred thousand dead, two million prisoners of war and one million missing. The war caused the outbreak of economic chaos and enormous popular discontent, provoked by the war’s excessive duration and the scarcity of food and basic consumer goods. Famine devastated the population and strikes became generalized. The government’s response to these problems, sending the strikers to the front, only spread the popular discontent among the troops, bringing the revolutionary workers of the cities to the military to spread their protest among the soldiers, who in their vast majority had been recruited from the loyal and submissive peasants. The revolutionary ideas of the workers rapidly took root among these peasant-soldiers. Soviets of workers, soldiers and peasants were being formed, and in the army nobody talked about anything else besides peace and the division of the landed estates. Mutinies became increasingly more frequent. The shortage of bread and of all kinds of supplies, the long lines and cold weather, triggered the first protests in Petrograd. The shortage of raw materials for industry led to the dismissal of many thousands of workers. Since most of the young men had been mobilized for the war, women now comprised 40% of the industrial workers. On International Women’s Day, February 23 (March 8, in the Western Calendar), the protests began. Women from the Vyborg district, having met in an assembly, voted to go on strike. The playful demonstrations of the morning became massive and uproarious by the afternoon, having been joined by metal workers. The slogans, “Peace, Bread and Freedom!” and “Down with the Czar” were shouted. In confrontations with the police the Cossacks displayed a certain amount of indecision, not being accustomed to engaging in the repression of urban crowds. The left, including the Bolsheviks (who enjoyed the support of the majority of the workers in Vyborg), had advised against going on strike and instead recommended the workers should wait. They were caught by surprise by the power of the movement. On the next day, one hundred fifty thousand workers demonstrated in the streets, and the Cossacks, the most loyal troops of the Czarist regime, began to be overwhelmed by the masses of the crowds and in some places refused to shoot, or only fired above the heads of the crowds. The city was paralyzed. On Znamenskaya Square there was a confrontation between the Cossacks, defending the threatened crowds, and the mounted police, which ended with the flight of the police. This meant that the Czarist state not only lacked the troops to repress the insurrection, but that its troops were even against it. The Baltic Squadron rebelled and the sailors of Kronstadt shot hundreds of their officers. The strike, begun by the workers on February 23, had by the 24th become a general strike and then gave way to the insurrection of the 25th. The Czar only responded with more repression. The city was an armed camp. On Sunday the 26th, in the early afternoon, a massacre took place at the Znamenskaya Square, where more than 50 people were killed by a detachment of fresh recruits of the Volynsky Regiment. After this massacre furious crowds stormed courts, police stations and prisons, freeing the prisoners. The masses obtained the support of the troops from several army barracks, who then confronted the police. The leftist parties, Mensheviks, Social Revolutionaries and Bolsheviks, especially, assumed leading roles in the movement and, together with the rebel regiments, took control of the entire city. The generalized mutiny of the military garrison of the 27th transformed the riots and the insurrection of the previous days into a revolution. On the 28th the red flag was waving over the prison-fortress of Saints Peter and Paul, the “Russian Bastille”. The police were hunted down and lynched in the streets. On this same day (the 28th), in the left wing of the Tauride Palace the Petrograd Soviet was created, while in the right wing the Duma met, and the two rival power centers were already apparent, located in the same building. The Czar, meeting with his advisors, attempted to introduce government reforms to nip the revolution in the bud. But the Czar acted very slowly, and inopportunely, while the revolution acted with great speed. The bourgeoisie, the generals and a large part of the nobility advised the Czar to abdicate in favor of his son or his brother. But when the Czar agreed to do so, it was already too late. The masses demanded a republic. In February 1917 a situation arose that became known as “dual power”. Together with the bourgeois state, and opposed to it, the workers councils, or Soviets, arose as a potential alternative government of the working class. On March 1 Order Number of the Petrograd Soviet was published, which guaranteed immunity for rebel soldiers, on condition that the latter recognize only the authority of the Soviet. Nicholas II abdicated on the following day. Negotiations between the Soviet and the Duma led to the formation of a Provisional Government, in which Prince Lvov held the position of Prime Minister. When the name of Lvov was announced to the crowds, one soldier expressed his surprise: “All we have done is exchange a Czar for a Prince?” (Figes, p. 385). The power in the streets, the real power, was held by the Soviets, but they had no intention at all of doing away with the government and assuming all power. Thus arose what Trotsky called “the paradox of February”, that is, that a revolution which had won in the streets gave way to a government formed in the salons. The Pact between the Petrograd Soviet and the Duma led to a republican Provisional Government, with a Kadet majority and some representatives of the Right Social Revolutionaries, such as Kerenski. The social composition of the new government had been changed from the nobility to the liberal bourgeoisie. The Soviets freed the political prisoners and organized supply. The Czarist police force was dissolved, trade unions were legalized, regiments that supported the Soviets were formed, etc., without waiting for any decrees to do so. The Government was limited to ratifying the decisions made by the Soviets, which were not decreed directly by the Government power because the latter was dominated by a Menshevik and Right Social Revolutionary majority that “completely ruled out the possibility of demanding a power that the working class was not yet capable of exercising” (Broué, p. 114), in accordance with the previously-established analyses of these parties with regard to the Russian revolutionary process. The Bolsheviks, led at the time by Kamenev and Stalin, supported these dogmas. In Pravda a radical shift took place when, in mid-March, Stalin took control of the editorial committee of the newspaper, and the latter began to publish numerous articles in favor of the idea of continuing the war: “The Bolsheviks henceforth adopted the theory of the Mensheviks according to which it was necessary for the Russian revolutionaries to continue the war in order to defend their recent democratic conquests against German imperialism” (Broué, p. 115). At the Party Conference of April 1, the Bolsheviks approved Stalin’s proposal to “support the Provisional Government”, as well as the possibility of a merger of the Bolsheviks and Mensheviks (Carr, Vol. 1, pp. 92-93). These political positions were in opposition to the popular will, which demanded the immediate end of the war and its hardships. The declarations of the Foreign Minister Milyukov with respect to the military commitments to the allies and the continuation of the war until final victory, provoked angry demonstrations, which led to a government crisis that ended with Milyukov’s resignation and the formation of a coalition government made up of Kadets, Right SRs and Mensheviks, with the latter two parties forming an overwhelming majority. Kerensky was named as Minister of War. The new government was viewed with approval by the allies, who understood the relation of forces in Russia and wanted a strong government, one that could keep Russia in the war. Lenin, enraged by what he considered to be the suicidal and catastrophic policy of the Bolshevik Party, wrote the so-called “Letters from Afar” while he was in Zurich in March, in which he elaborated the Bolshevik program for the next stage of the revolution: transform the imperialist war into a civil war; no support for the Provisional Government; clear differentiation from the Mensheviks; expropriation of the landed estates; arming the workers to form a workers militia and immediate preparations for the proletarian revolution; all state power must pass to the Soviets. The Bolsheviks in Russia, who did not accept the novel positions of the exile Lenin, only published the first of the four letters. Lenin and the other exiled Russian revolutionaries in Switzerland sought by every possible means to return to Russia immediately. Since the Allies denied them visas, they consented to return to Russia via Germany and German-held territory. The German authorities thought that the Russian revolutionaries would help create a chaotic situation that would hasten the defeat of Russia. Lenin and his comrades travelled across Germany in a “sealed” train car. Later, the enemies of Lenin and the Bolsheviks used this episode to accuse them of being Germany spies. Lenin arrived in Russia on April 3, 1917, at the Finland Station in Petrograd. His positions, which became known as The April Theses, were misunderstood and rejected by the majority of the Bolshevik leadership. On April 7 they were published in a brief historical article (“The Tasks of the Proletariat in the Present Revolution”) in which he tacitly embraced Trotsky’s theory of permanent revolution. He claimed that it was impossible to end the war without first defeating capitalism, which is why it was necessary to advance “… from the first stage of the revolution—which, owing to the insufficient class-consciousness and organisation of the proletariat, placed power in the hands of the bourgeoisie—to its second stage, which must place power in the hands of the proletariat and the poorest sections of the peasants”. He also claimed that the Bolsheviks would win over the masses by way of “a patient … explanation of” their policies: “As long as we are in the minority we carry on the work of criticising and exposing errors and at the same time we preach the necessity of transferring the entire state power to the Soviets of Workers’ Deputies, so that the people may overcome their mistakes by experience.” The Bolsheviks’ mission, he pointed out, was to stimulate the initiative of the masses. From this initiative the experiences would have to arise that would give the Bolsheviks the majority in the Soviets: then the moment would come when the Soviets can seize power and begin the construction of socialism. Lenin’s theses unexpectedly led to a violent upheaval within the Bolshevik Party. Pravda was obliged to publish a note in which Kamenev warned that, “these theses only represent the individual opinion of Lenin”. Lenin won the support of the working class cadres in his confrontation with the party leadership. He gradually won over some supporters, such as Zinoviev and Bukharin, and triggered the direct opposition of others, such as Kamenev. On April 24 an Extraordinary Conference of the Bolshevik Party was convened, presided over by Kamenev. The latter, together with Rikov and other leaders, defended the positions that Lenin had himself advocated in 1906. Kamenev asserted that “it is premature to state that bourgeois democracy has exhausted all its possibilities”. Lenin responded by saying that such ideas were old formulas that the old Bolsheviks “senselessly learned by rote instead of studying the specific features of the new and living reality”, and concluded by reminding Kamenev of Goethe’s famous saying: “Theory, my friend, is grey, but green is the eternal tree of life” [The last two quotations are excerpts from Lenin’s “Letters on Tactics”, published as a pamphlet in April 1917. See: http://www.marxists.org/archive/lenin/works/1917/apr/x01.htm#bkV24E020. Translator’s Note]. Although he emerged as the victor with regard to the basic political theses, his victory was not total, because, of the nine members of the Bolshevik executive committee, four opposed his theses. Trotsky had returned to Russia on May 5, and was immediately invited to join the party leadership. The 6th Congress of the Bolshevik Party began on July 26, without Lenin, who had gone into hiding, and also without Trotsky, who had been arrested during the “July events”. The Congress witnessed the merger of various small organizations with the Bolshevik Party, which now counted one hundred seventy thousand militants, forty thousand of whom were in Petrograd. The leadership that was elected at the Congress proved to be a faithful reflection of the relation of forces: of the twenty-one members of the executive committee, sixteen belonged to the old guard Bolshevik fraction. Lenin, Zinoviev and Trotsky won the most votes. The victory of The April Theses was now total. The road to insurrection was now cleared of all internal obstacles in the party (Broué, pp. 116-126) [This and all subsequent citations from Broué appear to relate to the French edition of his book, Le Parti Bolchévique: Histoire du P.C. de l’U.R.S.S., Editions de Minuit, 1971—Translator’s Note]. Dual power rapidly unraveled towards social confrontation, characterized by the choice between continuing the war, as the bourgeoisie and the nobility advocated, or immediate peace, demanded by the popular classes. Lenin had pointed out in May that “the country was a thousand times more leftist than the Mensheviks and a hundred times more leftist than the Bolsheviks”. Soldiers, workers and peasants were increasingly more radicalized against the war, because they suffered its direct consequences. The Provisional Government, however, decided to continue the war regardless of the cost. Pressure from the allies and the “civic patriotism” of the Provisional Government caused the latter to launch an offensive, under the command of Brusilov, which ended in a military catastrophe and mass desertions. 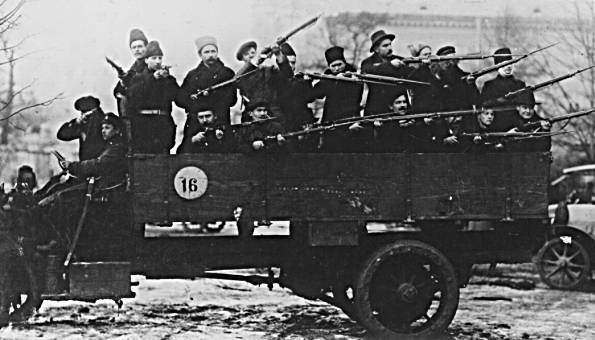 The order to transfer the Petrograd garrison to the front led to an uprising of the soldiers that was joined by the workers. The popular demonstrations of July 3 and 4 culminated in the occupation of Petrograd by the masses, who demanded the resignation of the Provisional Government. The demonstrators took to the streets calling for the overthrow of the Government, all power to the Soviets, the nationalization of the land and industry, workers control, and bread and peace. The Kadets availed themselves of the opportunity presented by the crisis to resign from the Government, and Kerensky assumed the presidency of a Government that was now composed solely of Mensheviks and Right SRs. The Bolsheviks, after a propaganda campaign against the Government, in which they called for all power to the Soviets, thought that an insurrection would be premature, although the main cities were already wracked by uprisings, especially the capital, Petrograd. The Bolsheviks were not only incapable of stopping the insurrectional movement but were, at first, shouted down by the masses, until they finally joined them. After ten days of demonstrations the insurrection came to an end without a clear victor. The Bolshevik appeal to return to work was now heeded. The Provisional Government accused the Bolsheviks of being responsible for the July incidents, and accused Lenin of being a German spy, revealing the history of the sealed train car. Some neutral regiments passed into the Government camp and many workers, Mensheviks and SRs, were confused by these calumnies. At this point, which was so favorable to the Government, the repression against the Bolsheviks was initiated. Their press was banned, their local offices were attacked, Trotsky and Kamenev were arrested, Lenin went into exile in Finland and the most high profile Bolshevik cadres went into hiding. The most important phenomenon, however, took place in the rural areas. The peasants had not only ceased to believe in the promises of reform of the socialists in the successive Provisional Governments, but, also influenced by the appeal of the Bolsheviks to direct action and the occupation of the land, engaged in a generalized occupation of landed estates throughout the entire country. The Kadets reassumed their posts in the Government and demanded, in a kind of ultimatum, harsh measures against the spread of disorder. Kerensky, however, proved to be incapable of establishing social order and military discipline. The repression carried out by the Cossacks against the peasants caused the latter to irremediably move closer to the Bolsheviks, who proclaimed the slogan, “Peace, Bread and Land”. In August, Kerensky convoked a National Conference, attended by political, social, economic and cultural forces from the whole country, for the purpose of achieving “an armistice between capital and labor” (Broué, p. 128). The Bolsheviks boycotted the Conference, which was a complete failure: all that was left was the military coup d’état. The bourgeoisie, the nobility, the allies and the General Staff promoted a coup d’etat, which was to be led by General Kornilov, who had until then enjoyed the full confidence of Kerensky. Kornilov, at the command of Cossack troops, moved towards Petrograd on August 25. Kerensky stripped Kornilov of his command, although he continued to hold confused negotiations with him, while Kadets and Mensheviks abandoned the Government. Kerensky, a caricature of a new Czar, went to the front in order to try to avoid facing the real problems. Meanwhile, in a Petrograd abandoned by the Provisional Government, the Soviets organized the defense against Kornilov. The sailors of Kronstadt freed the Bolshevik prisoners, Trotsky among others, and the party emerged from clandestinity. Its cadres and militants immediately won an overwhelming majority in the military garrison and in the factories. Trotsky was once again elected to the presidency of the Petrograd Soviet and formed the Revolutionary Military Committee, an organ of the Soviet that merged its troops with the recently created Red Guard, composed of groups of armed workers. Kornilov and his Cossacks could not even get near Petrograd. The railroad workers refused to allow the trains carrying Kornilov’s troops to proceed, or else they diverted them to other destinations. The soldiers themselves mutinied as soon as they became aware of the nature of their mission. On September 3, Kornilov called off his coup d’état and surrendered to the Government. The coup attempt had turned the situation to the advantage of the Bolsheviks. The soldiers assemblies arrested and sometimes executed officers suspected of sympathizing with Kornilov’s coup attempt, and approved of resolutions in favor of Soviet power and peace. On August 31 the Petrograd Soviet demanded that all power should pass to the Soviets, and on September 9 it condemned the idea of a coalition with the bourgeoisie. On September 13 Lenin sent two letters to the Central Committee of the Bolshevik Party in which he maintained that the preconditions for the seizure of power had sufficiently matured. But the majority of the Central Committee, led by Zinoviev and Kamenev, was still opposed to staging the final proletarian insurrection. They thought that conditions were still as immature as they were in July. Trotsky supported the insurrection if it was carried out to coincide with the Soviet Congress, which was scheduled to meet at the end of October. Lenin only obtained the support of the young Smilga, president of the Finland Soviet. On October 10 Lenin, wearing a disguise composed of a wig and a hat, and having shaved his goatee, returned to Petrograd from exile in Finland, in order to drag the Central Committee, by ten votes against two (Zinoviev and Kamenev), to a resolution in favor of insurrection, so that preparations were immediately undertaken (Broué, pp. 126-134; Figes, pp. 456-507). The February Revolution had overthrown the Czar and established democratic freedoms and a bourgeois republic. But the Russian revolutionary process did not stop halfway and drove towards its conclusion, in order to overthrow the power of the bourgeoisie and to establish the workers power of the Soviets. The preparations for the insurrection were never a secret to anybody. Kamenev and Zinoviev openly denounced them in the press. The Revolutionary Military Committee, responsible for the insurrection in Petrograd, organized the entire operation. Furthermore, the October insurrection was not actually carried out in obedience to a decision made by the Bolshevik Party Central Committee, but as a refusal of the Soviet to comply with the order issued by the Kerensky Government to send two-thirds of the Petrograd garrison to the front. The bourgeois Government attempted, once again, to disperse the revolutionary troops of Petrograd and replace them with counterrevolutionary battalions. The October events took place only a few weeks after Kornilov’s coup attempt, in opposition to the new attempt to crush the revolution, forcing the proletariat to take insurrectional measures to defend it. The forces of the Revolutionary Military Committee were not numerous, but they were absolutely decisive: the Red Guard, the sailors of the Baltic Fleet, the city’s garrison and the workers militias. Some thirty thousand men actively participated in the insurrection. The revolt of the working class neighborhoods, which remained peaceful, was not necessary; nor was it necessary to assault the military barracks, because they had already been won over to the revolution before the insurrection. The date of the insurrection was fixed for the night of the 24th, because on October 25 the Soviet Congress was scheduled to meet. On the evening of the 24th all the members of the officer corps who did not recognize the authority of the Revolutionary Military Committee were arrested, and the police stations, printing plants, bridges, and public buildings were occupied, patrols and checkpoints were set up on the most important streets, and the state bank, the railroad stations, the telegraph offices, and the telephone exchange and electric power plants were seized. In just thirteen hours Petrograd was in the hands of the revolutionary soldiers and workers under the orders of the Soviet. At ten in the morning on the 25th the Government only held power in its own headquarters, the Winter Palace, which had been under siege for several days. Just after sunset on the 25th, the cruiser Aurora fired a salvo that marked the beginning of the assault on the Winter Palace. Lenin wanted to announce the fall of Kerensky’s Government to the assembly of the Soviet Congress. The troops defending the Palace resisted until they were given the chance to escape. Finally, the Winter Palace surrendered during the early morning hours of the 26th of October, after a joint assault staged by sailors, soldiers and workers. The Provisional Government, which had met in a session to organize resistance in the capital, was arrested; Kerensky, however, escaped in a requisitioned car to the American Embassy. Between October 28 and November 2 the workers insurrection was also victorious in Moscow, and after two or three weeks it had spread to practically all of Russia. On that same morning of October 26, the Second Soviet Congress, with a large Bolshevik majority, elected a revolutionary government, composed in its majority by Bolsheviks and Left SRs, and approved the first decrees of the new government. Lenin was elected president of the Council of Peoples Commissars. Peace was declared, and an immediate ceasefire was promulgated on all fronts. Trotsky, who had been named Commissar of Foreign Affairs, assumed responsibility for beginning peace negotiations with Germany. On December 2 an armistice was signed and on March 4, 1918, a peace treaty, called the Brest-Litovsk Treaty after the town where the negotiations were held, was signed, triggering a bitter polemic between those who wanted to sign the peace treaty at any price, as a means of defending the new Soviet state, and those who advocated spreading the revolutionary war to Europe; this conflict threatened to split the Bolshevik Party. A decree was passed legalizing the confiscation of the landed estates and the transfer of the land to the peasant Soviets, workers control in industry and the nationalization of the banks. The rights of national minorities were recognized, including the right to self-determination and the freedom to secede from Russia. The new Soviet government, which was not recognized by the Allies, still faced the radical opposition of all of the rest of the political spectrum, from the extreme Czarist right to the Mensheviks. The outbreak of civil war only a few months later, with the intervention of foreign powers, was inevitable. The Bolsheviks were politically isolated and faced serious problems. The Mensheviks still thought that the seizure of power by a workers party was madness, since the famous “objective conditions” prevented the process from going beyond the tasks of a bourgeois revolution: according to them, what was needed now was to develop democratic liberties. The Right Social Revolutionaries oscillated between demanding that the Bolsheviks commit political suicide, that is, that Lenin and Trotsky be expelled from Russia, and calling for armed confrontation. The Left SRs confronted the Bolsheviks over the question of whether or not to dissolve the Constituent Assembly. In the Constituent Assembly, elected by universal suffrage, the Bolsheviks were a minority. The Left SRs were underrepresented, because the Social Revolutionary Party had named its candidates before the announcement of the split by the left, which had majority support in the military bases and the countryside. Faced with the refusal of the Constituent Assembly to approve the “Declaration of Rights of the Working and Exploited People” (approved by the Third Soviet Congress), the Bolsheviks abandoned the Assembly, and then a detachment of Red Guards entered the meeting hall and pronounced the Assembly closed. That was the end of parliamentary democracy in Russia. A dangerous situation ensued, characterized by the mixture and confusion of the state bureaucratic apparatus and the cadres of the Bolshevik Party. The civil war began with the revolt, in May 1918, of the Czechoslovakian Legion, composed of some fifty thousand soldiers under French commanders. These units proceeded westward, and soon reached the Volga. The success of this operation led the Allies to intervene, for the purpose of crushing the revolution and restoring the Czarist regime. In June, Anglo-French troops landed at Murmansk and Archangel. In August, the Allies landed one hundred thousand men in Vladivostok, on the pretext of helping the Czechoslovakian Legion. In the South, the Czarist general Denikin formed an army of volunteers with British supplies and materiel: this was the origin of the White Guard. In September, Trotsky, the creator of the Red Army, obtained the first Soviet success with the defeat of the Czechs and the reconquest of Kazan. In 1919 the French seized Odessa, the Ukraine and Crimea; the English took over the oil wells of the Caucasus and the Don Basin. Russian soil was also occupied by American, Polish, German and Serbian troops. The situation was desperate. Clemenceau’s plan to encircle the Bolsheviks was fulfilled. But dissensions among the Allies and the political incapacity of the generals of the White Guard, who were incapable of making any concessions of autonomy to the national minorities (a question that was of interest to the Cossacks) or of land to the peasants, in order to obtain their support, allowed the Red Army to resist for the thirty months the civil war lasted. Finally, the revolutionary wave that shook Europe and the military successes of the Reds led to the signing of another armistice. The civil war had left the country in ruins. Private trade had disappeared (Broué, pp. 163-170). The measures known by the name of “war communism” were therefore the results of the necessities imposed by the war. In order to feed the besieged cities and the army, harvests were requisitioned. The poor peasants were organized against the Kulaks. There was no government revenue, since the administrative apparatus had disappeared. The uncontrolled printing of paper money triggered inflation. Famine and epidemics devastated the cities, which were the heart of the revolution. Wages were paid in kind. The industrial workers were sent to the battlefronts. The terror of the political police (the Cheka) made its inevitable appearance: nothing would ever be the same. Industrial production plunged. The production of iron and steel was minimal. Almost three-quarters of the railroad lines were unusable. Land under cultivation was reduced by one-fourth. The Kulaks killed their livestock and concealed their harvests in order to prevent their requisition. It was in this context that the Kronstadt revolt took place, at a naval base close to Petrograd with a proud Soviet and Bolshevik tradition. In March 1921, Trotsky assumed command over the suppression of the uprising of the sailors of Kronstadt, who, during the revolution of 1917, had been “the pride and glory of the revolution”, in Trotsky’s own words. It was also during that month that the 10th Congress of the Bolshevik Party banned fractions and tendencies in the Bolshevik Party, and when Lenin proposed the “New Economic Policy” (NEP). During that same period, no less than fifty separate peasant revolts were underway. The most important revolt was that of the Ukrainian anarchist Makhno, who controlled the entire Ukraine. The Party decided to change its economic policy, but the armed repression of broad, undoubtedly revolutionary sectors of the population constituted a counterrevolutionary turning point for the Soviet revolution. It was hardly surprising that Kronstadt had been crushed for defending the slogan, “Soviets without Bolsheviks” (Brinton, pp. 137-144; Mett, pp. 39-116). The so-called NEP entailed the implementation of a series of extraordinary economic measures, motivated by the catastrophic consequences of the war, and laid the foundations for Russian State Capitalism. In order to increase productivity it was decided to stimulate private entrepreneurial initiative, prohibited in 1917, and to permit profit making in small-scale agricultural and commercial enterprises. The forced requisitions were eliminated, and much of the land was handed over to the Kulaks, thus creating a domestic free market. At the same time, the state created large state farms, the Sovkhoz, and agricultural cooperatives, the Kolkhoz. Enterprises employing fewer than twenty workers were privatized, and the liberalization of wage policies and production quotas were authorized for private enterprises. The presence of foreign technicians was authorized. A tax “in kind” was established and foreign investments, under state control, were authorized. The state system was directed by the Supreme Soviet of the Economy. The NEP created a certain degree of stability and allowed production to rise to pre-war levels. But in the process, the Soviets were eviscerated and the revolution died. The NEP came to an end in 1927, with the announcement of the first five year plan, which placed economic priority on heavy industry to the detriment of consumption goods. As a result of the disasters, impoverishment and devastation caused by the civil war, the isolation of the Russian Revolution following the failure of the international revolution, the deaths of numerous Bolshevik militants, economic chaos, a famine that caused millions of deaths, and generalized misery, but above all thanks to the identification of the Party with the State, a bureaucracy arose which secured its position with the victory of the political counterrevolution and the costly and poorly managed industrialization imposed by the victorious State Capitalism. In 1922 Lenin had warned of the dangers of this statist trend. The bureaucracy had rendered the Soviets, the trade unions, and the party cells and committees meaningless, and subjected them to the state apparatus and its counterrevolutionary directives. As of 1923, Stalin embodied this new bureaucracy of the Party-State that led a brutal political counterrevolution. The basic prediction of the Bolsheviks in 1917 was that, in view of Russia’s economic backwardness, a victorious workers revolution could only survive with the international extension of a revolution that would have to be worldwide, and that the first concrete step towards this revolution would take place in Germany. Otherwise, the Russian Revolution would be defeated. In 1924 the bureaucracy adopted the theory of “socialism in one country” and the cult of personality devoted to the mummified Lenin, as the two foundations on which the new Stalinist ideology would be erected. The Russian bureaucracy, now having cast off its disguise, appeared to be ready to definitively crush all opposition. Stalinism grotesquely deformed the concept of the meaning of socialism, deprived the Soviets of all content, abolished the least trace of workers democracy, and imposed a personal dictatorship over the party, and that of the party over the country, thus constructing a totalitarian regime. The bureaucracy needed to annihilate all the cadres of the Bolshevik leadership who had carried out the October Revolution, since the concealment of its own counterrevolutionary nature was one of the characteristics of Stalinism. Thus, there were numerous purges throughout the 1930s, which condemned hundreds of thousands of dissidents, real or imagined, regardless of their ideologies, to death and disgrace, among whom figured the Bolsheviks themselves, and especially their most important leaders. Trotsky was assassinated in August 1940 in Mexico, where he lived in exile, by Ramón Mercader, a Spanish Stalinist agent who carried out Stalin’s orders. In the Spanish civil war the Stalinists led the counterrevolution in the republican camp, physically and politically eliminating anarchists, POUMists and dissidents. In August 1939 the Hitler-Stalin Pact was signed preparatory to the invasion of Poland. At the end of the Second World War, the Red Army occupied half of Europe, establishing totalitarian regimes, satellites of the Soviet Union, which rapidly collapsed after the fall of the Berlin Wall in October 1989. These Stalinist regimes experienced various workers and popular insurrections, such as the revolts in Berlin in 1947, Hungary in 1956 and Czechoslovakia in 1968. The fall of the Berlin Wall, in October 1989, was the beginning of the end of the Soviet Union and of all the Stalinist states. •	Exploitation of the workers by means of State Capitalism, led by the Party-State, which militarized labor. The Stalinists were never a reformist sector of the workers movement, but were always the party of counterrevolution and of the ferocious repression of the revolutionary movement. No collaboration was every possible with Stalinism, only a relentless struggle. Stalinism, always and everywhere, has led and directed the counterrevolutionary forces, deriving its power from the idea of national unity, the practice of a policy of law and order, its struggle to establish a strong government, an economic policy based on nationalization, the infiltration of the militants of the Stalinist party into the state apparatus, and especially disguising its reactionary nature in the midst of the workers movement (Munis, pp. 158-290). The greatness of Red October resides in the fact that it was the first proletarian revolution in history, the first time that the proletariat seized power, overthrowing the government of the bourgeoisie. The communist revolution can only be a world revolution, and it failed in Russia when the revolutionary proletariat was defeated in Germany and the Soviet revolution remained isolated. This isolation, combined with the catastrophes of the civil war, economic chaos, poverty and famine, magnified the terrible mistakes of the Bolsheviks, among which the identification of the Party with the State stands out, which led to the inevitable triumph of the Stalinist counterrevolution, carried out from the very ranks of the Bolshevik Party that had inspired the Soviet Revolution of October 1917. The Stalinist counterrevolution was therefore of a political character, it destroyed all political and ideological opposition, it harshly repressed proletarian groups and movements that were undoubtedly revolutionary, and persecuted to the extent of physical extermination those who expressed the least dissidence, whether within or outside of the Bolshevik Party. In Russia, the revolutionary process that had begun in 1905, obtained its first success with the democratic revolution of February 1917, which overthrew the Czar and established a democratic republic, but did not stop halfway and continued to the end with the insurrection of October 1917 in Petrograd, in which the Soviets seized power, replacing the bourgeoisie of the state apparatus. The Stalinist counterrevolution was therefore of a political character, and was embodied in the monopoly of power held by the Bolshevik Party, in the form of nationalization and state economic concentration (State Capitalism) and in the transformation of the Bolshevik Party into a Party-State. Far from being a mere coup d’état, as the ruling class would have us believe, the October revolution is the highest point yet reached by humanity in its entire history. For the first time the working class had the courage and the ability to seize power, wrenching it from the grip of the exploiters and beginning the world proletarian revolution. Even though the revolution would soon be defeated in Berlin, Munich, Budapest and Turin, even though the Russian and the world proletariat had to pay a terrible price for its defeat—the horror of the counterrevolution, another world war, and all the barbarism suffered under the Stalinist states—the bourgeoisie is still unable to erase the memory and the lessons of this formidable event. The worst legacy of Stalinism has been its perverse utilization of the Marxist-Leninist ideology as the orthodox continuation of “Marxism”, which is thus undermined and discredited as a theory of the proletarian revolution. Leninism used a Marxist language to justify totalitarian regimes, which had nothing to do with Marx’s analyses, which he produced between 1844 and 1883, concerning capitalism and the exploitation of the proletariat. Lenin himself, in his ideas and analyses on the party, nationalism, the Russian Revolution, etc., clashed head-on other Marxist theoreticians, such as Luxemburg, Bordiga, Gorter and Pannekoek, who were among the first to denounce the worst aberrations of Leninism. The Leninist concept of the party considers that the working class is incapable of attaining a degree of consciousness that goes beyond shortsighted trade unionist and reformist ideas. The party must inoculate the working class, from the outside, with socialist and revolutionary consciousness. This idea, as Pannekoek demonstrates in his book, Lenin as Philosopher, is foreign to Marx, who clearly proclaimed that, “the emancipation of the workers will be the task of the workers themselves”. The (bourgeois) right of national self-determination, proclaimed by Lenin, introduces nationalist ideology as a fundamental goal of the proletariat in the struggle for its emancipation. As Rosa Luxemburg stated in her debate with Lenin, the ideology of national liberation of the oppressed peoples is a bourgeois ideology, absolutely foreign to the class struggle and the emancipation of the proletariat…. The tactics employed by the Bolsheviks in Russia could not be applied to the situation in Western Europe of the time, where the communist parties advocated antiparliamentary and anti-trade union tactics, and were dogmatically condemned by Lenin. See the “Open Letter to Comrade Lenin”, written by Gorter in response to Lenin’s pamphlet, Left Wing Communism: An Infantile Disorder. There is, then, an entire Marxist corpus, which denounces not only the totalitarian barbarism of the Stalinist and Fascist regimes, but also some of the worst theoretical aberrations of Leninism: this corpus is the inalienable inheritance that has been bequeathed to us by the various fractions of the communist left. Neither Leninist ideology nor Stalinist totalitarianism are Marxist. By Marxism we mean the critique of the political economy of capital, carried out by Marx in the mid-19th century, his method of research, and the theoretical elaboration of the historical experiences of the proletariat (The Communist Manifesto, Capital, The 18th Brumaire, etc. ), continued by Engels, Luxemburg and the communist left (Russian, Italian and German-Dutch). This communist left was composed of tiny fractions that, in harsh conditions of isolation and physical and political persecution, criticized, utilizing the Marxist method, and in the practice of the class struggle, the distortions of the Third International, and Stalinist and Fascist totalitarianism. The Marxist critique of the Stalinist regimes, the result of the theoretical analysis and the struggle of these left communist fractions within the Communist International itself, which defined with greater or lesser clarity these regimes as State Capitalist, can be found in the bibliography listed below.